The best position to sleep in to eliminate back pain while sleeping involves having a firm mattress for back support and the best sleeping pillow for lying on your side. Have you ever been taught how to sleep? If you sleep restlessly or in pain, or wake up in pain, then learn how to take the tension off of your whole body while you sleep. Known by the ancients and rediscovered by chiropractors, sleeping well is simply a matter of proper sleep posture; which is determined by your mattress and your pillow. Most sleep specialists agree that your body needs to be in a neutral position to sleep comfortably. This is absolutely correct. They also think this means that your head must be level when sleeping on your side, but in this they are wrong. Side posture is the best sleeping position for back pain. To be in a neutral position when sleeping on your side, you need a firm mattress to support your hip and shoulder which are against the mattress. When lying on your side, your lower back is closer to the mattress than your upper back, simply because your shoulders are wider than your hips. This means that your body is NOT level but is gradually inclined from your lower back up to your upper back. This also means that for your whole body to be neutral, your neck and head need to be in this same inclined plane. Your pillow must tip the top of your head up a little so that your head is NOT level but is tilted to match the incline plane of the rest of your body. The videos above show the reactions of people when they are put into this position for the first time. If your mattress isn't firm enough OR your pillow sinks in, then your head won't stay at the correct height through the night and you will toss and turn to get comfortable. A firm mattress and pillow are necessary for the sleep system to work. We have designed a very comfortable firm mattresses as the foundation of our sleep system, and an adjustable pillow to raise your head so that your spine is neutral. These products are only available through this website or at a practitioners office. Our Sleep EZ Adjustable Pillow allows you to gently raise your head until your body relaxes just right. 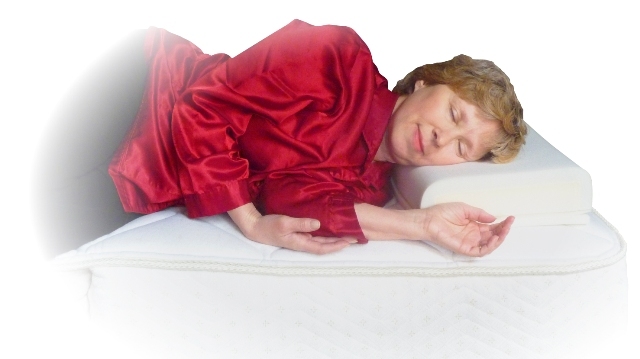 Our Luxuriously Firm Mattress offers a decadent, yet firm feel which is consistant with our sleep system. Our Simply Firm Mattress is the right firmness to match our sleep system. Our RV Mattress offers the same sleeping comfort as the Luxuriously Firm mattress and is designed to fit in RV's. Back pain when sleeping no longer has to be your problem.